Its not so easy to find free WooCommerce themes for online shopping (eCommerce) sites. Here we have collected 25+ latest and best Bootstrap 3 based free WooCommerce WordPress themes online and published all of them together here. All themes are designed using twitter bootstrap 3 frontend framework and tested with latest WordPress installation and WooCommerce 2.1+ versions as well. For your sake of convenience we have build child WordPress theme for most of WooCommerce themes and zipped them with core theme along with installation instructions. Good luck and Have fun. Multishop is clean and spacious WordPress theme specially made for eCommerce (online shopping) websites compatible with very famous WooCommerce plugin. 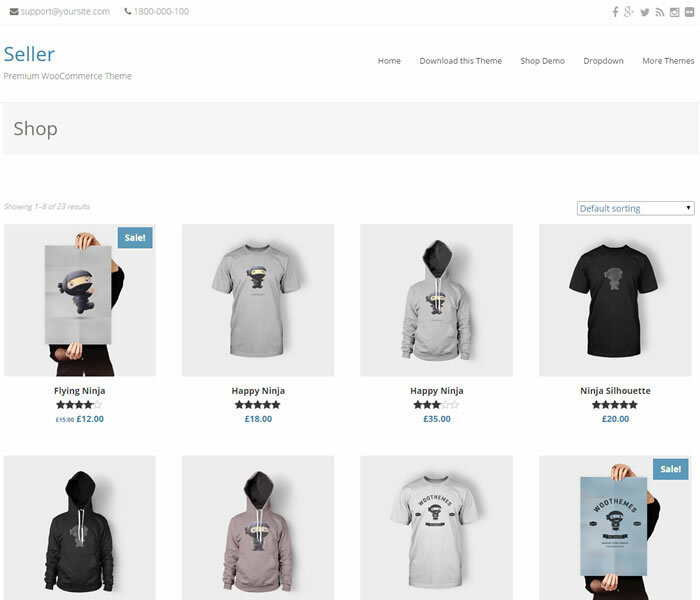 Its HTML5 compliance theme designed based on bootstrap v3.3.1 framework makes Multishop theme into ultra responsive and will helps your website automatically resize itself in all kind of device displays. Enabled to support full width header image and loaded with useful custom widgets, unlimited colour options, built-in Google analytics support, much needed font options, Font Awesome icon fonts, custom page templates very handy as well. Outlet is premium like free WooCommerce WordPress featured with full width header slider and comes with unique theme features which is easy to customizable via extensive theme options panel. Enabled to support WordPress live customizer and also included with custom CSS panel, you can easily add CSS without modifying core theme CSS files. Outlet is search engine friendly, cross browser compatible WordPress theme compliance with HTML5 / CSS3 standards. Easily change your desired Google fonts via theme options panel and supports unlimited colour options as well. 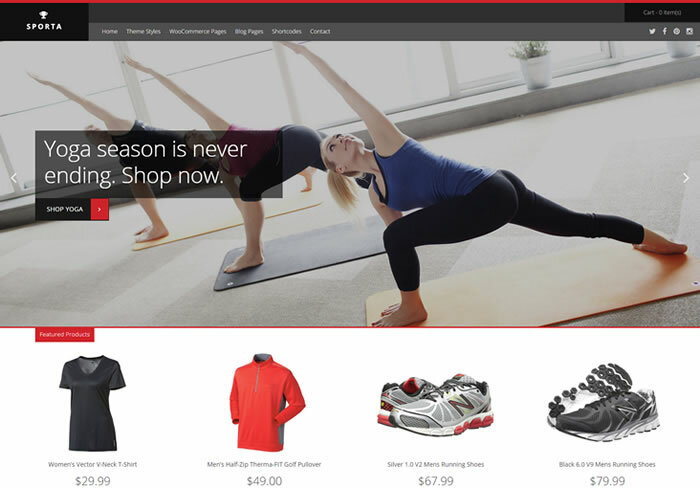 Sporta is yet another free WooCommerce WordPress theme suitable for sports goods related shopping websites and featured with full width header slider absolutely is a wow factor for this theme. Customize the look and feel via live WordPress customizer with real time preview and customize everything you wish. Sporta is SEO conscious WordPress theme loaded with handy shortcode elements, powerful custom widgets, Google web fonts support, Font awesome icon fonts and bundled with XML file to build demo site in simple steps. TopShop ultra light & clean style free WordPress theme made for eCommerce website and its perfectly compatible with WooCommerce shop plugin. Powered through Site origin page builder framework and its quite easily customizable WordPress theme also great fit for blogging and business websites. TopShop loading ultra fast even in slow internet connection assures to ranks your website on top in search engines. Comes with full width header slider helps you to spotlight specific posts to grab the user attention and preloaded with 2 beautiful header designs, full width / boxed layouts, Google web fonts & font awesome icons support, useful custom widgets and still more. 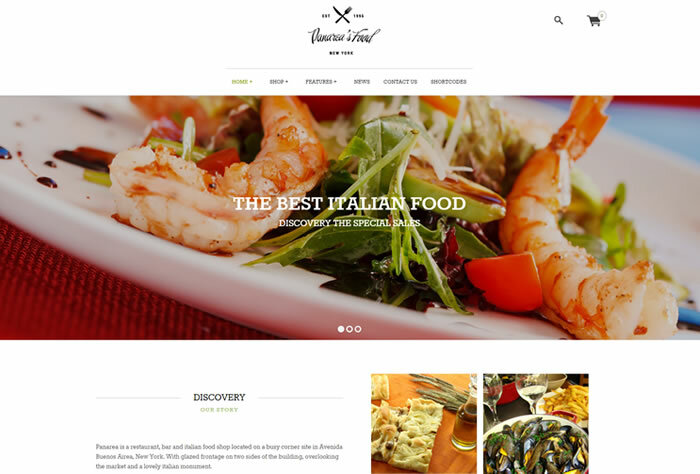 Panarea is ultra modern, parallax enabled free WooCommerce WordPress theme suitable for food related website like restaurants, cafe shops, bistro and so on. Its 100% responsive & retina ready premium like WordPress theme able to disable responsive layout via theme options panel. Easily choose the layout type either boxed or stretched layout and there is advanced option available in theme options panel that allows you remove query strings from static contents. Able to upload your own logo and capable to turn on / off featured images, title, date, tags, share buttons and author info for posts and page through theme options panel just a click away without any code modifications. 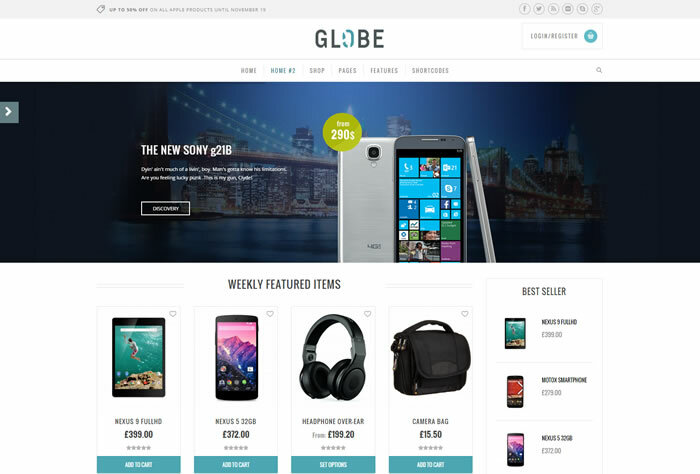 Globe is WooCommerce powered eCommerce WordPress theme built using Yithemes 2.0 framework and bootstrap 3 frontend framework. Globe theme specially made WordPress theme fits perfectly for technology products online shopping websites such as mobile phones, electronic gadgets, laptop and more. 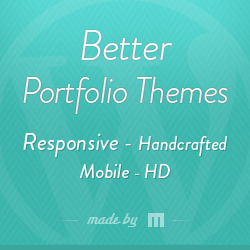 Enable to support boxed / stretched layout and responsive / non responsive layout as well through theme options panel. Globe is full widgetized premium like WooCommerce WordPress theme comes with plenty of custom widgets, unlimited colour options, handy page templates, XML demo content and lot more. 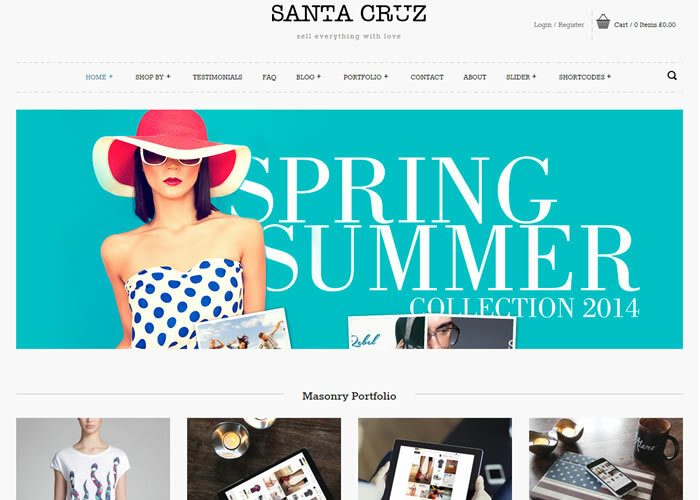 Santa Cruz is clean, minimal & feature rich WooCommerce WordPress theme designed based on bootstrap 3 framework and powered by Yiithemes framework. Built your ultra responsive & retina ready online shopping website in easy steps and sell anything online and theme included with 100’s of useful features to make your business a long-lasting and profitable success. It has numerous page templates, portfolio templates, breadcrumb navigation, 50+ shortcodes, beautiful header sliders, unlimited colour options, Google web fonts & maps support and plenty of more features. 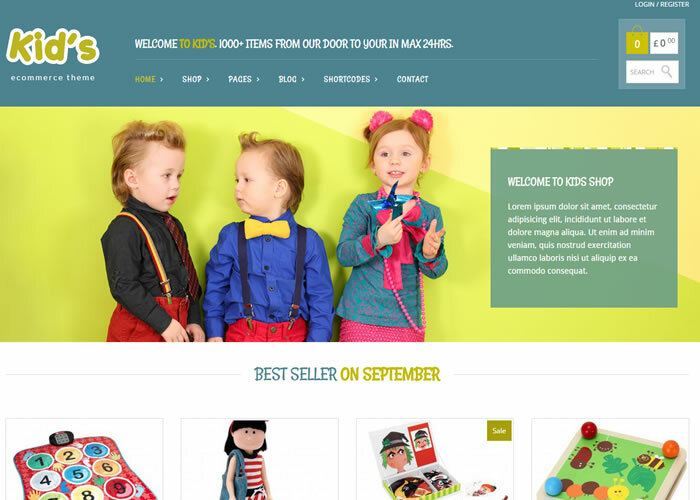 Kidshop is very creatively designed, vibrant looking free WooCommerce WordPress theme designed based on with bootstrap 3 framework. Has 100% responsive & retina ready WordPress theme, specially made for kids stores online shopping websites and you can easily set the product pages through inutiative theme options panel. Able to showcase the products in grid or list view and easily include new tabs to add more details about the product. Kidshop premium theme has wishlist feature, advanced checkout layout, multiple home page layouts, product comparison, Awesome header slider and lot more. 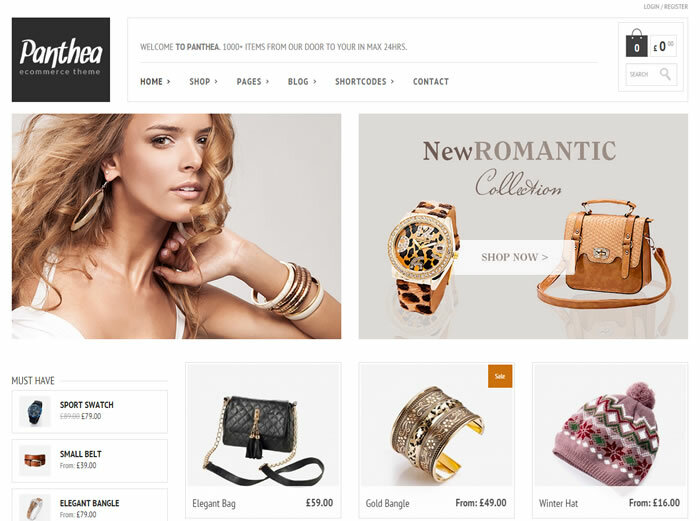 Jewelry shop is very powerful & versatile WooCommerce free WordPress theme built for jewelry, ornamental and luxury products shops. Comes with powerful theme options panel to show / hide display login links, search bar, language switcher, responsive behavior, top bar menu and also configure the products page, product details page and category pages the way you want. Easily setup your website in multilingual languages using WPML WordPress plugin to gain more visitors to your website. Panthea is clean & modern WooCommerce wordpress theme included with very powerful features and pixel perfect design. Built to suppot full width header image and regognize users display and resize automatically with its responsive layout design. Panthea premium version theme enabled to support megamenu navigation, couple of home page variations, Google web fonts support, Slider revolution copy (worth $18), built in shortcode manager container over 200+ very useful shortcodes does makes a lot of difference when it compares with premium version features. But, free version gives you better idea before you buy a premium version. Have a try! 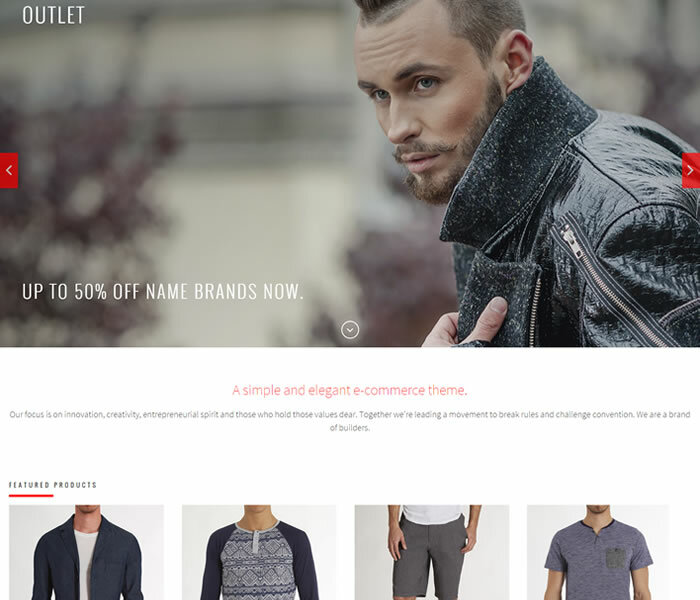 Socute is very handsome & minimal looking WooCommerce WordPress theme to be used for fashion and apparel related websites. 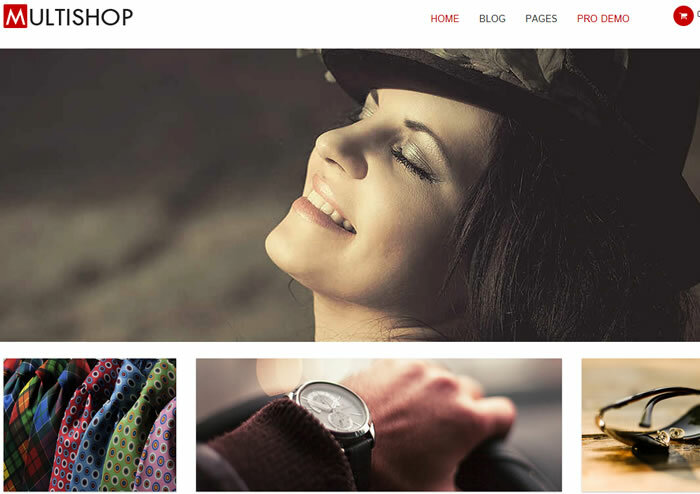 Its one of the most appealing WordPress theme available for WooCommerce based websites added with wishlist, pretty photo lightbox support with beautiful hovering effects, zoom product image, great ajax layered filter, product compare option with prefect responsive layout and automatically loads high resolution images in retina device displays. Also has breadcrumb navigation, powerful custom widgets, unlimited colour options, popup subscription form, full width static header and plenty of added features helps you build powered packed online shopping website with advanced features. 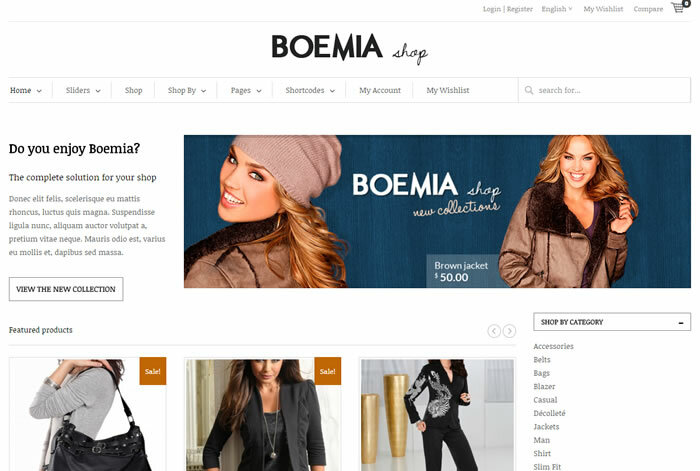 Boemia is Bootstrap based free WooCommerce WordPress theme comes with 1170 pixels wide and 100% ultra responsive layout which will automatically adopts users display. Its powerful and complete solution for online shopping sites and boemia theme included with handy custom widgets such as shop by brand, shop by category, latest news widget and other features such as built-in related posts, social share icons, premade inquiry forms, breadcrumb navigation, useful portfolio templates and still a lot. 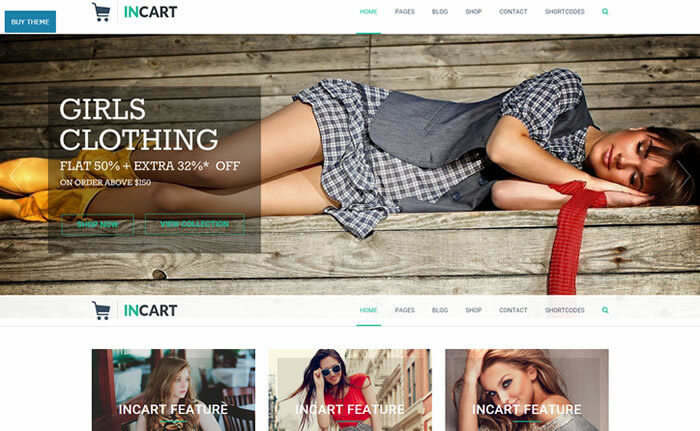 InCart is outstanding free WooCommerce WordPress theme comes with sticky header menu makes navigation so easier than before. 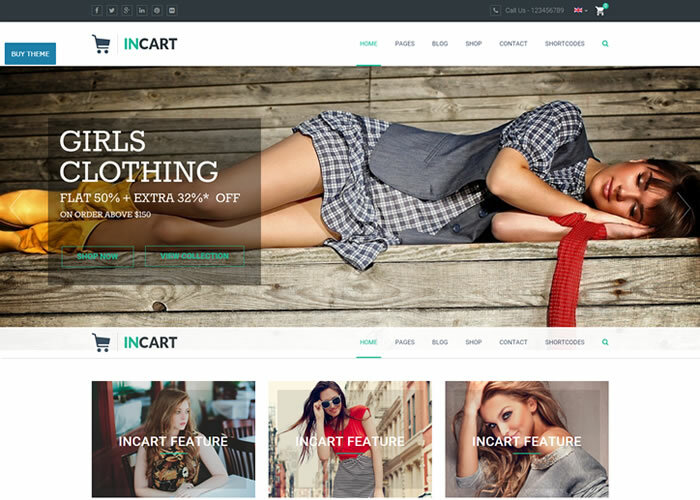 InCart is multilingual ready, fully responsive WordPress theme, tested with WordPress 4+ and WooCommerce 2.1.x above versions. Built to support unlimited colour options, widgetized footer, breadcrumb navigation, Font awesome icon fonts and premium version included with 3 beautiful blog layouts, 4 post format support, $18 worth slider revolution premium plugin, video slider, plenty of shortcodes and much more. StoreFront is one of the most downloaded and very flexible free WooCommerce WordPress theme from the house of WooThemes. Its 100% responsive WordPress theme built using famous underscores starter theme with nestable grid system and schema markup helps you to rank well in search engines. Storefront is perfect for all kind of WooCommerce powered shopping sites. Its multilingual ready WooCommerce WordPress theme built with custom home page templates and able to extend theme features with storefront extensions which is available through WooThemes repository. 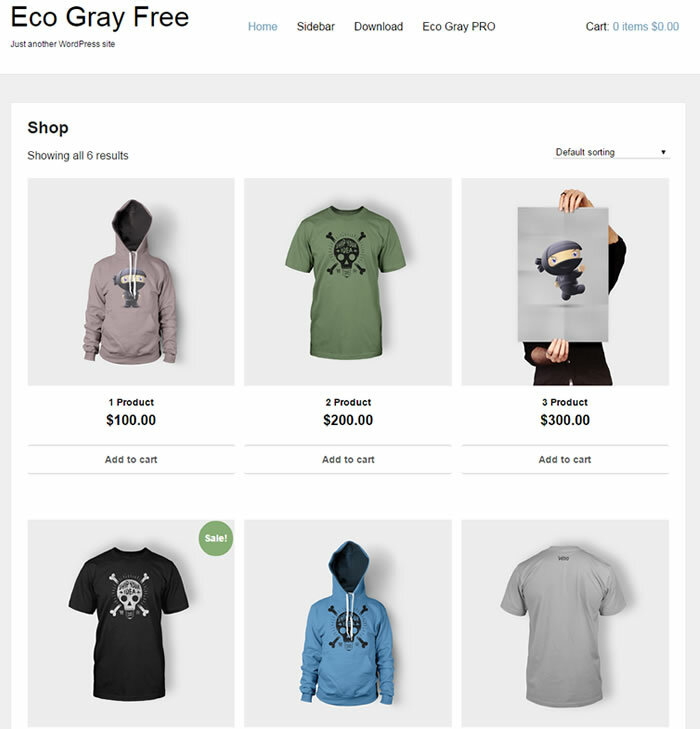 Eco gray is simple and elegant WordPress theme made for WooCommerce powered shopping sites and theme optimized for drop down menu navigation. Its search engine friendly, cross browser compatible WordPress theme bundled with .PO and .MO fi;es helps you translate website in your preferred language and also included with ready to use chinese, dutch, english, french, german, greek, hungarian, italian, polish, russian, spanish language files as well. Seller is clean & lightweight multipurpose woocommerce WordPress theme suitable for corporate, business and shopping websites. Included with responsive content slider jQuery script handles full width slider so beautifully and designed based on bootstrap 3 framework. Seller is 100% responsive, retina ready, SEO friendly multipurpose WordPress theme comes with 4 column footer widget section, Font awesome icon fonts, drop down navigation and compatible with most modern browsers as well. 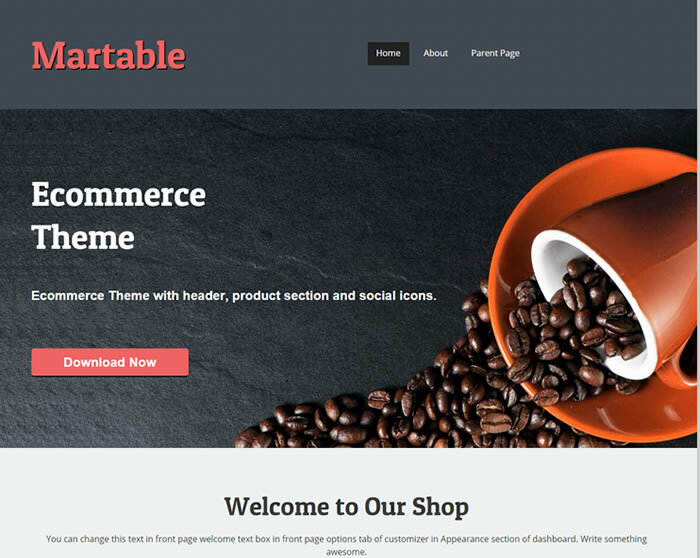 Martable is bold & beautiful multipurpose WooCommerce WordPress featured with full width header media and enabled to support custom background or custom background colour as well. Its 100% responsive, retina ready free eCommerce WordPress theme has 3 column footer widget and able to switch between boxed or stretched layout via theme options panel. Its 2 column WordPress theme able to build multilingual so easily using bundled language files and enabled to support threaded comments as well. Also turn on / off featured images in post or pages and able to choose your own header style with available 2 header designs before you publish the post. 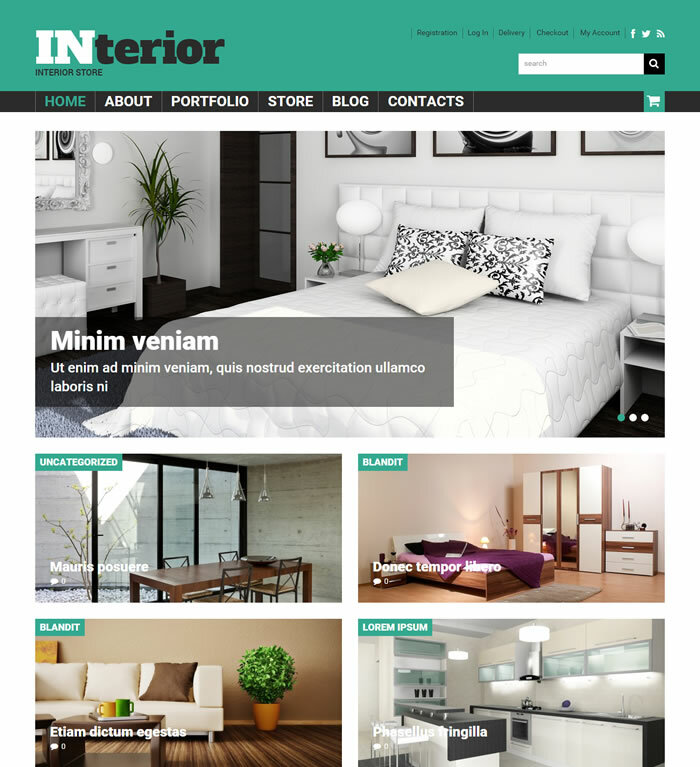 Interior Store is very sleek and modern free WooCommerce WordPress theme suitable for interior design, furniture and similar business. Has outstanding layout and loaded with custom layouts, powered by famous cherry framework and designed based on mobile first bootstrap 3 framework. Built with plenty of shortcodes, 6 post format templates and compatible with WPML multilingual WordPress plugin is very handy to build multil-language website so easily. Lingerie is retro styled free WooCommerce WordPress theme suitable for lingerie, inner wears and women’s apparel websites. Lingerie W3C compliance WordPress theme, Works great with WooCommerce online shop plugin out of box included with .PO files, comes with some of custom widgets and enable to support Google web fonts, Google maps. Lingerie is cross browser compatible, search engine friendly free WooCommerce theme included with various page / post templates and clean documentation to help you properly use the theme. SpaSalon is feminine looking free WooCommerce WordPress theme built for beauty shops, salons, spa centers and similar businesses. SpaSalon is 100% responsive, retina & RTL translation ready free WooCommerce theme designed based on twitter bootstrap 3 frontend framework. Setup full width header slider via powerful theme options panel and included with contact us template, useful shortcode elements, social icons and plenty of useful features available with SpaSalon theme. 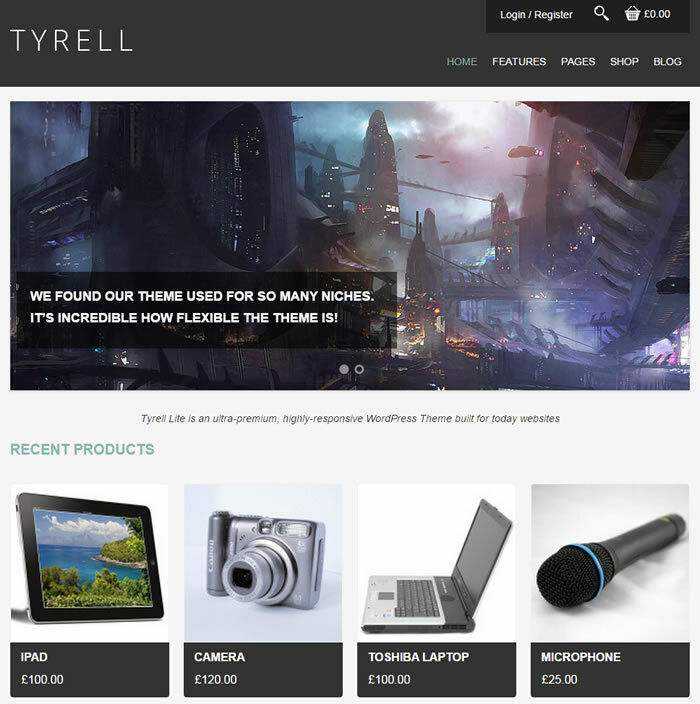 Tyrell Lite is free WooCommerce WordPress theme compliance with HTML5 /CSS3 standards coded with best SEO practices. Its 100% responsive WordPress theme looks great on all kind of device displays and compatible with most famous WordPress plugins such as All in One SEO pack, Yoast SEO plugin, WP Super cache and contact form 7 free WordPress plugins. Built with powerful administration panel offers you 100’s of handy features and options helps you to modify each and every elements of theme without touching single line of code. Tyrell Lite is translation ready WordPress theme comes with .PO/.MO files and its fully compatible with WPML multilingual WordPress plugin. Enabled to support Boxed / full width layouts and comes with fully responsive slider helps you to showcase your favorite posts in it. 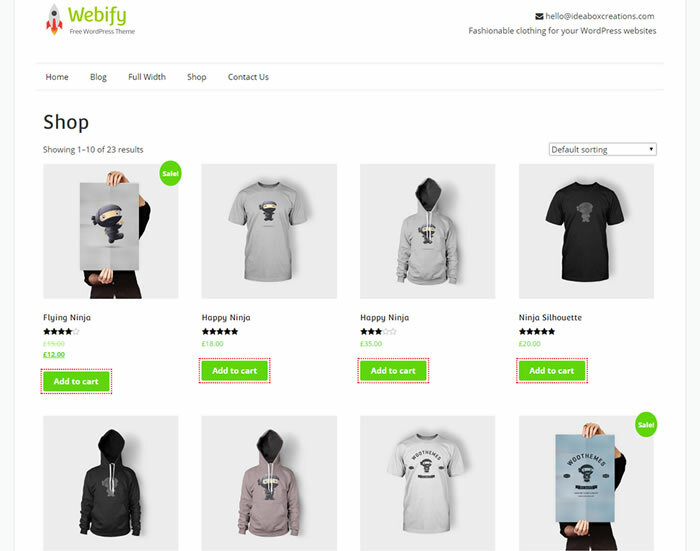 Webify is vibrant looking multi-purpose WooCommerce WordPress theme enabled to support WordPress live customization and gives you a wide range of colors to choose from. 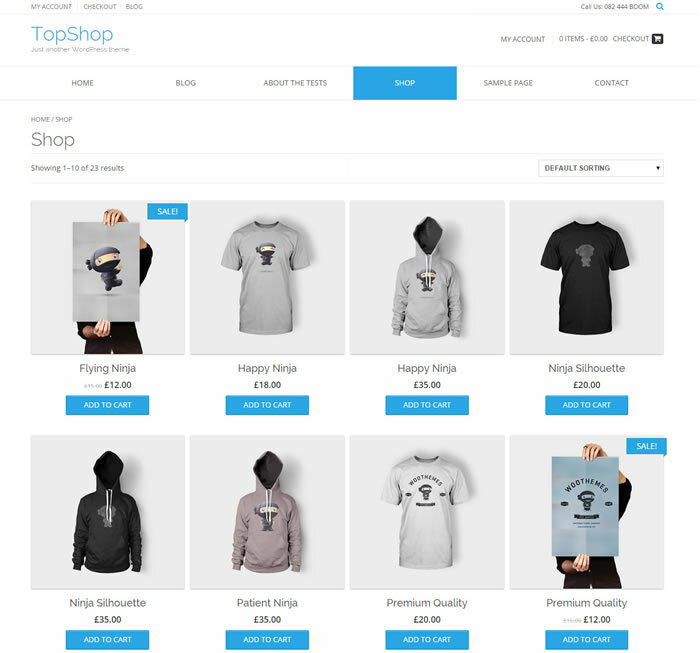 Built to support full width and boxed layout and featured with “Tap to call” button on your website quite easily via theme options panel and theme suitable for personal, business and online shopping sites. Designed using Twitter Bootstrap 3 framework and included with font awesome icons, custom message header option, home page slider, custom CSS option, signup form and lot more. 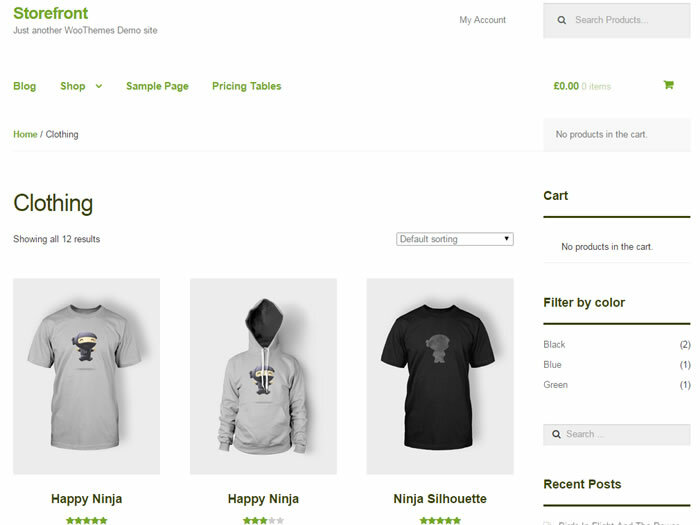 We hope that you might find these WooCommerce themes are very useful for you and don’t forget to share it via social sharing sites using below buttons. In case if you found any broken links, don’t forget to notify us via below comment form.